Megan Slowey is a healthcare research analyst at CHRT. She performs data analysis and research of health care trends in Michigan and nationally. She also supports the Washtenaw Health Initiative. 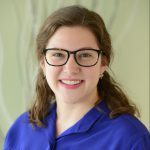 Prior to joining CHRT, Megan worked as a research assistant at the Center for Midlife Science at the University of Michigan School of Public Health, where she provided support in data collection, management, and analysis to both the Study of Women’s Health Across the Nation and the Michigan Bone Health and Metabolism Study. She has also worked as a field research lead with the University of Michigan Department of Obstetrics and Gynecology for a study on contraceptive choice and unsafe abortion in Ghana. Megan holds a Master of Public Health in Global Health Epidemiology from the University Of Michigan School Of Public Health and a B.S. in Public Health with minors in Cell & Molecular Biology and Psychology from Tulane University.